Feature Detection Machining is one of the most exciting new enhancements added to our 2017 Mill product lineup. In short, it offers you the ability to program your toolpath strategies based on a part’s 3-dimensional geometric features, regardless of which CAD system the part was originally designed in. If you have a closed polysurface part (i.e., a solid) or even a closed mesh solid with prismatic features, now those features can be detected and machined. This is the first in a series of informative posts on this topic. Feature Detection Machining is important because it can save you a lot of time during the CAM process. Instead of you having to analyze a part to determine what features to cut, the software does it for you! 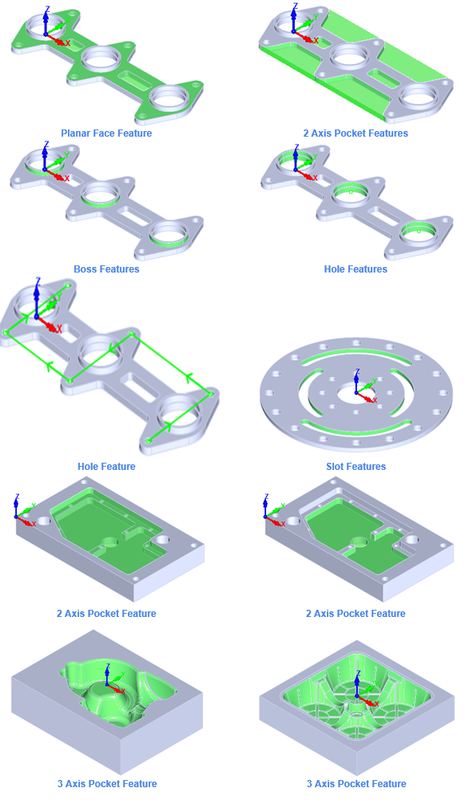 Also, once a feature is detected in a part, you can simply apply a toolpath strategy to it. Because the software has already captured the properties of the feature, it knows what control geometry and depth values to use! Not only that, but it also understands what set of toolpath strategies can be applied to it. All of this saves time and makes your job a lot easier, and that’s what it’s all about! What Features Can be Detected? Holes: This is any feature that is derived from a circular profile. These hole types include: through holes, blind holes, tapered holes, counterbore, and countersink holes. Multiple holes of the same parameters are automatically grouped into hole patterns. They can be machined as a pattern or individually. Pockets: This is any feature with a closed perimeter and vertical sides that removes area from the part. Both bling pockets and through pockets fit into this category. 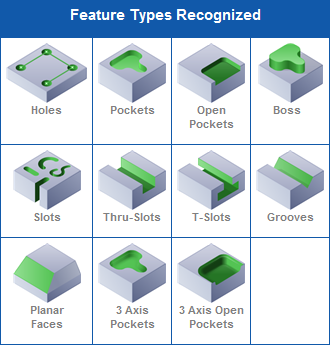 Open Pockets: These have the same characteristics as a Pocket but has an open perimeter that passes through one or more sides of the part. Boss: This is any feature with a closed perimeter that extrudes above the planar surface, adding area to the part. Slots: These are a type of Pocket whose perimeter has a constant centerline and width and full radii. They can be blind or pass completely through the part. Multiple slots of the same width but different depths are automatically grouped together to form slot patterns. They can be machined as a pattern or individually. Thru-Slots: These are the same as Slots, but whose ends pass completely through the part. T-Slots: These are a special type of Slot that can be machined from the same direction as a Slot but using a T-Slot cutter. T-Slots must pass completely through the part. Grooves: These are similar to Thru-Slots and that pass completely through the part. Planar Faces: These are any face that is planar. 3 Axis Pockets: These are any pockets extending below the planar face that contain non-prismatic contours. For example, a mold cavity would be detected as a 3 Axis Pocket. 3 Axis Open Pockets: These are any Pockets extending below the planar face that contain non-prismatic contours, but that also extend through one or more sides of the part. These can be considered Open Pockets with contours.